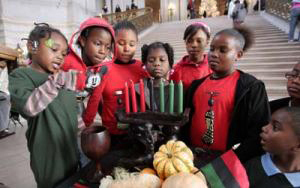 San Francisco – The Village Project and the Bayview Y present San Francisco’s seventh annual Kwanzaa, featuring a special celebration of the 150th anniversary of the Emancipation Proclamation. This year’s event will again highlight the seven principles of Kwanzaa (Nguzo Saba), with 14 free events taking place over seven days throughout San Francisco. Each celebration begins with a spiritual ceremony, followed by a feast, live entertainment and a lighting of one of the seven candles of the Kinara. The many performers will include rhythm and blues bands the Soul Mechanix and Bernard Anderson and the Old School Band. 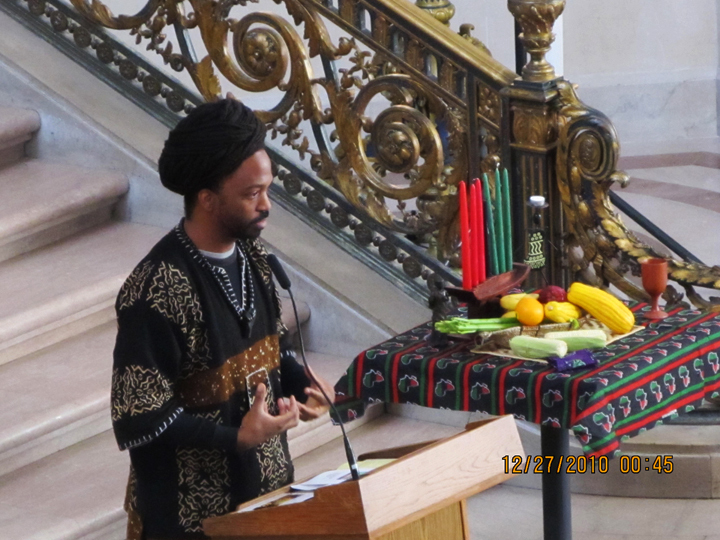 The seven-day celebration opens at San Francisco City Hall at noon on Wednesday, Dec. 26, with a keynote address from Dr. Amos C. Brown, pastor of Third Baptist Church, and a special recognition of Tempi Priestly, executive director of Renaissance Parents of Success, for her service to youth, families and the community of Bayview Hunters Point. Other highlights of this year’s Kwanzaa celebration include “A Celebration of Our Elders” at Westbay Conference Center, 7 p.m. on Dec. 26; “A Celebration of Dance,” featuring The Village Dancers of Crossroads and the Laney College Dance Department at Hamilton Rec Center, 2 p.m. on Dec. 27 ; “A Celebration of the Emancipation Proclamation” at 2 p.m. on Jan. 1 at the Bayview Opera House Ruth Williams Memorial Theatre and “A Night of Gospel” at St. Cyprian’s Episcopal Church at 6 p.m., featuring Emmit Powell and the Gospel Elites and Kevan Peabody leading the First Friendship Institutional Church’s Praise Team. All events are free and open to the community. For more information, go to www.kwanzaasanfrancisco.com or www.thevillageprojectsf.org. Friday, Dec. 28: 1 p.m. – WAFRC/Western Addition Senior Center (Queen Adah), 1390 Turk at Fillmore (“An Inter-Generational Moment”), performance by Jay’e and Friends; 5:30 p.m. – Bayview Y/Bayview Library, 1601 Lane St.
Tuesday, Jan. 1: 2 p.m. – Bayview Opera House Ruth Williams Memorial Theatre, 4705 Third St. at Oakdale (“Celebration of The Emancipation Proclamation”); 6 p.m. – Union of Black Episcopalians, St. Cyprian’s Episcopal Church, (“A Night of Gospel”), 2097 Turk at Lyons, performances by Emmit Powell and The Gospel Elites, along with Kevan Peabody and the First Friendship Institutional Church’s Praise Team. Created by Dr. Maulana Karenga in 1966, Kwanzaa is celebrated annually by more than 30 million people worldwide over seven days, from Dec. 26 to Jan. 1. The values of Kwanzaa, Nguzo Saba (The Seven Principles), are critical tools for addressing the issues facing the African-American community. Ceremonies will be led by Brotha’ Clint, Kwanza Morton and Malik Seneferu. There will be a candle lighting and pouring of libation ceremony, live entertainment and a feast at each event. For more information, visit www.thevillageprojectsf.org or www.kwanzaasanfrancisco.com. Adrian Williams is the founder of The Village Project, a youth service organization focusing on education and cultural enrichment for youth and their families in the Western Addition. She has revived the celebration of Kwanzaa throughout San Francisco by connecting traditionally African American communities for this celebration. The YMCA has long been at the forefront of providing quality, free or low-cost programming for youth and families. Their programs are run by caring, experienced staff with a focus on youth development principles: safety, relationship building, skill building, community involvement, and meaningful youth participation. The Bayview Hunters Point Y has been the co-sponsor for the San Francisco Kwanzaa Celebration for the past four years. Help us to continue this important community celebration. Please send donations to The Village Project, 2097 Turk St., San Francisco, CA 94115, (415) 424-2980, www.thevillageprojectsf.org, and watch http://www.youtube.com/user/fillmovillageproject.